Lord Krishna is one of the most popular and worshipped deities of the Hindu religion. Krishna is considered as the eighth avatar of Lord Vishnu, the divine. 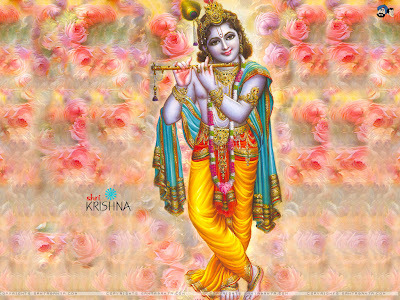 Shri Krishna is the very embodiment of love and divine ecstasy that destroys all pain and offense. Lord Krishna took birth over five thousand years ago in Mathura, India to Devaki (Sister of Cruel Demon-King Kansa) and Vasudeva in the prison cell of the tyrant Kansa. The sage Narada had predicted that Kansa would be killed by his nephew, so the king killed Devaki's first six children. The Seventh, Balarama escaped and the eighth, Krishna was clandestinely exchanged for a cowherd's daughter. Krishna was greatly attached to his foster mother, Yashoda. The lord had immense love for cows being nurtured in the cowherd's family. In his childhood, he was really fond of Makhan (butter) and there are many famous mischiefs regarding this love. Later Krishna loved to play flute and used to seduce the village girls. His favourite was Radha who is claimed as the love of Krishna. And this is one of the famous love stories of Hindu mythology. The Lord is usually remembered and worshipped as Radha-Krishna. The pair symbolizes the eternal love between people and god. Krishna is recognized as the god of Hasya or humor and a messenger of peace. Sri Krishna is the naturally loving and sweet aspect of Vishnu, Lord of Srimati Radharani and center of the spiritual abode. Krishna is the defender of sacred utterances. Krishna is a trickster and lover, a mastermind of all forms of knowledge and born to set up the religion of love. He is also known for his bravery in destroying evil powers throughout his life. It is believed that the Supreme Lord comes down from time to time in this material world to reestablish the teachings of the Vedas. Lord Krishna promises in his Bhagawad Gita: "Whenever and wherever there is a decline in religious practice, O descendant of Bharata, and a predominant rise of irreligion--at that time I descend myself. To deliver the pious and to annihilate the miscreants, as well as to reestablish the principles of religion, I myself appear millennium after millennium." Shri Krishna Aarti completes the worship or prayers made to the God. It is believed that aarti provides a completion to the puja .This arti of lord Krishna is also known as Janmashtami Aarti, which is usually sung on the birthday of Krishna. Krishna Chalisa means a prayer of "forty verse", which praise and entreat Sri Krishna with devotion. They are recited over and over again to recall the virtues of Krishna, the Lord, in order to aid the disciple to meditate on good and righteous qualities. One who pleases the Cows and the Nature.